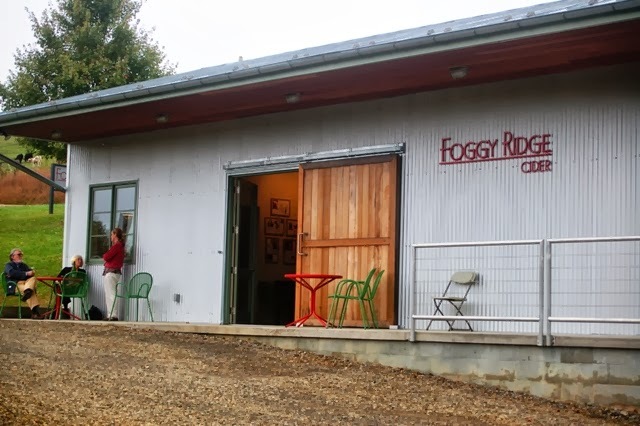 Yes, it is indeed a foggy ridge. Diane Flynt - the First Lady of Virginia Hard Cider – planted her orchard in 1996 and fermented her first vintage of cider in 2005. 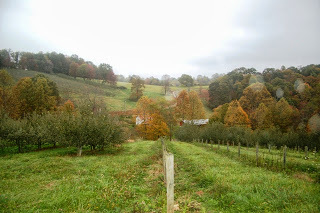 Today, Diane’s Garden of Eden outside Floyd, Virignia, grows 30 different varieties of apples, spread across 200 acres and produces 4,000 to 5,000 cases of cider a year. Don't expect your grocery store variety of apples – cider apples are tart and tannin: “They call them spitters for a reason,” Cider Slinger Connie told the Wine Dogs were told during their tasting. 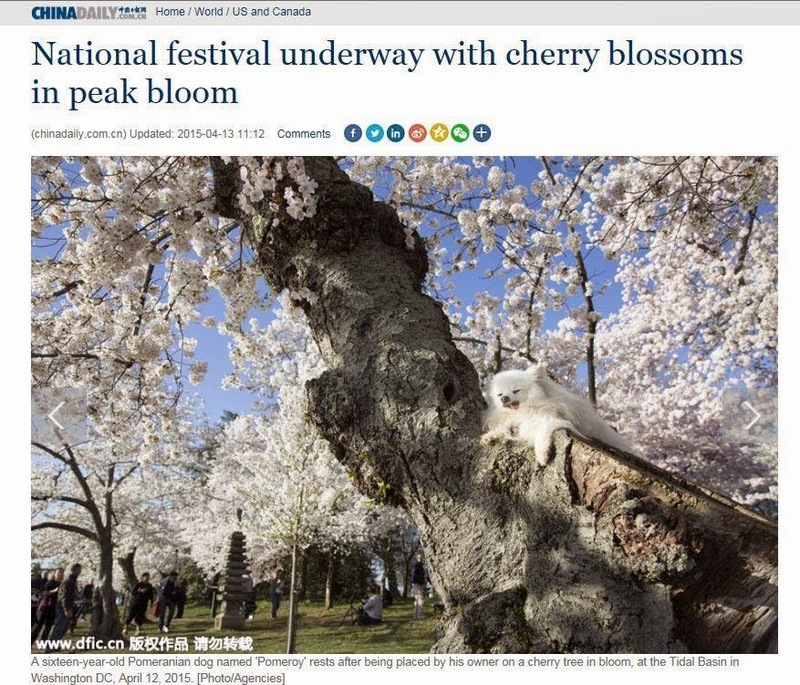 It’s a different story after the apples spend 6-8 weeks in steel tanks and are transformed into delightful sparkling beverages that left the Wine Dogs be-cide themselves with joy. 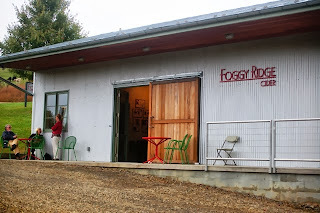 The walls of the cidery are replete with article of accolades for Foggy Ridge from local and national publications (will we see the Wine Dog review on our next visit?). 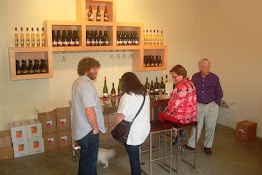 Connie poured four distinct hand-crafted ciders. The Serious Cider reminded the Wine Dogs of a Brut Champagne (or Virginia Sparkling Blanc de Blanc). 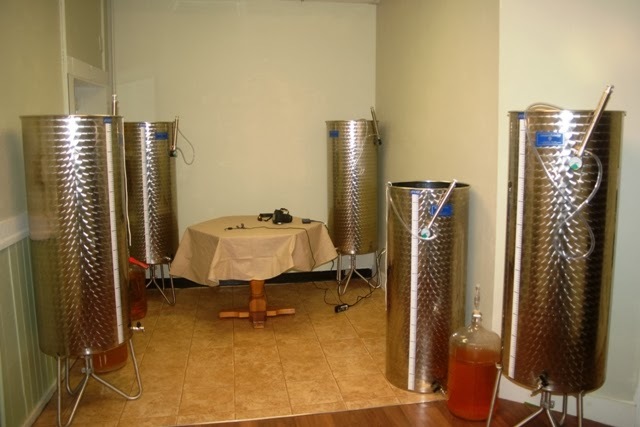 Three ingredients go into the cider – apples, carbonation, and yeast. Serious Cider is made from Old English apple varieties, including Roxbury Russets which are found just across from the cidery. 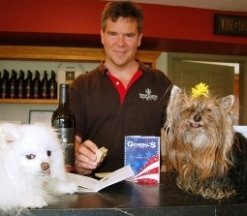 The Wine Dogs found it paired well with cheese as they enjoyed a bottle at a table overlooking the orchard. 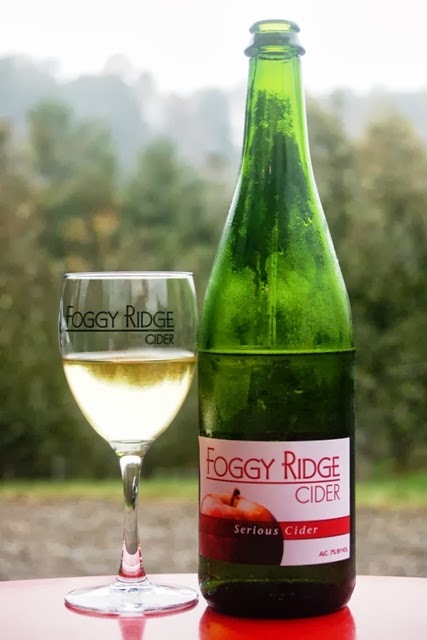 Foggy Ridge's First Fruit cider blends early season American heirloom apples – grafted from Thomas Jefferson’s trees at Monticello. This is a rich fruity cider with lively acidity. 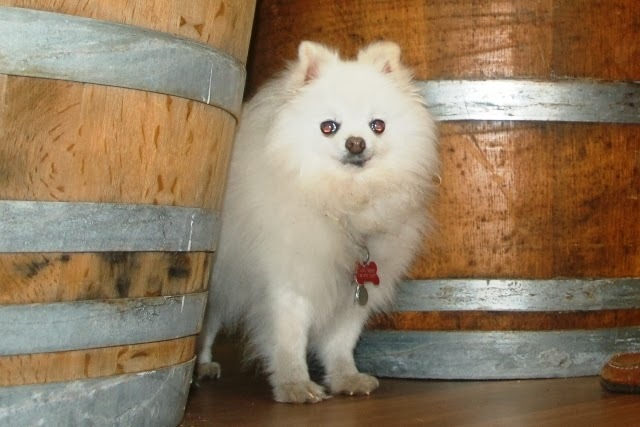 Little Ecco gave her “Paws Up” to the Sweet Stayman – a crossover cider with 2.3 percent residual sugar. 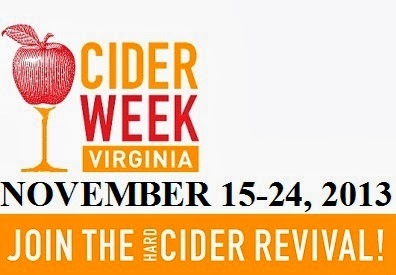 The Cider blends Virginia Stayman apples with heirloom varieties like Pink Lady and Grimes Golden. 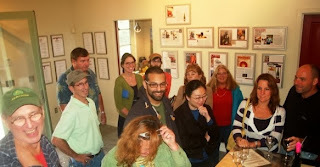 The result is a lightly sweet cider. 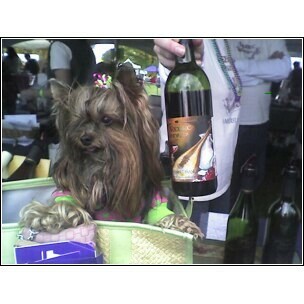 The older and more sophisticated Pomeroy gave his enthusiastic two Paws Up to the Port-style cider, Pippin Gold. 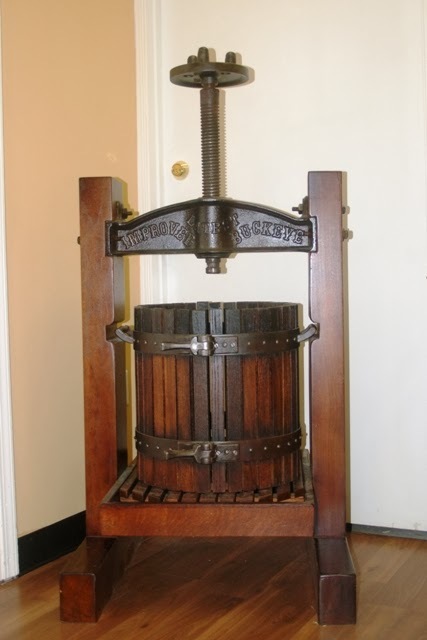 The cider is blends Newtown Pippin hard cider with apple brandy from Laird and Company, America’s oldest distillery, making Apple Jack since 1780. 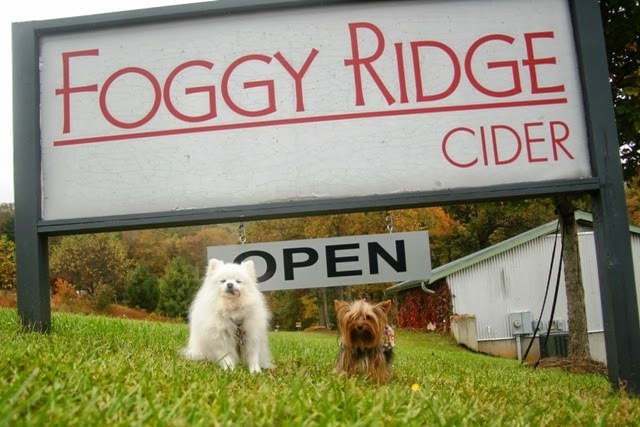 There are currently eight cideries in Virginia – chances are you’ve passed signs for one or two as you wine your way across the Commonwealth. 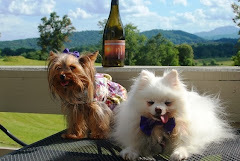 The Wine Dogs note that one of our fav local wineries, Cobbler Mountain, released a wicked sparkling hard cider of its own over Columbus Day Weekend, which earned a “Paws Up” from both pups. Check them all out during Cider Week Virignia! 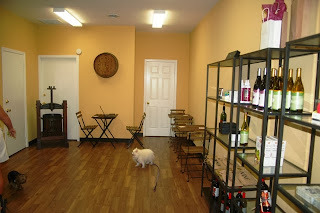 A new winery - actually a microwinery - opened in downtown Front Royal last week, and Ecco and Pomeroy simply had to poke their heads in to bring you the scoop. 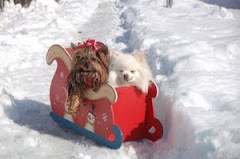 and the Millers, Jason and Amber. Amber and Jason’s passion for wine started in 2002, when they purchased a cabin in the Shenandoah Valley, a jumping off point for touring Virginia Wine Country. 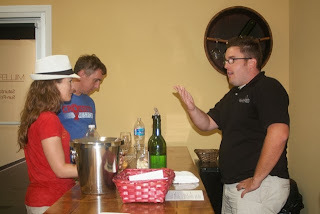 Four years ago, Jason graduated to home winemaker and in 2012, he teamed up with Erik Bandzak, who pioneered urban city micro-wineries in Baltimore with Aliceanna Winery. 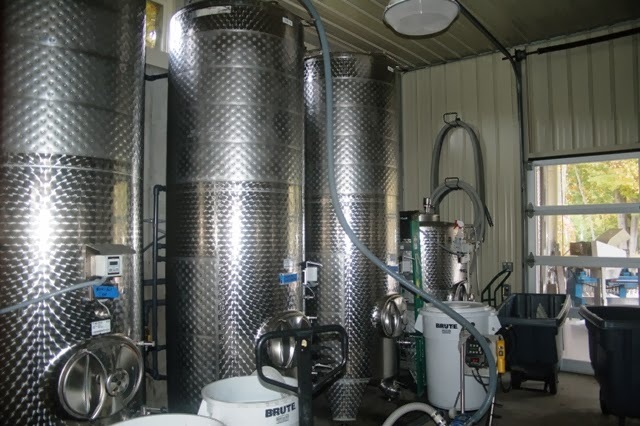 The back of the house includes the winery - housing several Italian stainless steel tanks and two carboys where the Millers make wine in batches, 60 gallons at a time. Total production is 2,000 bottles (yes, bottles, not cases). 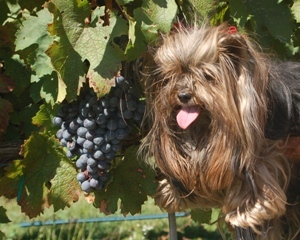 The plan is to double production next year, adding Merlot, Cabernet Sauvignon, and Chambourcin. 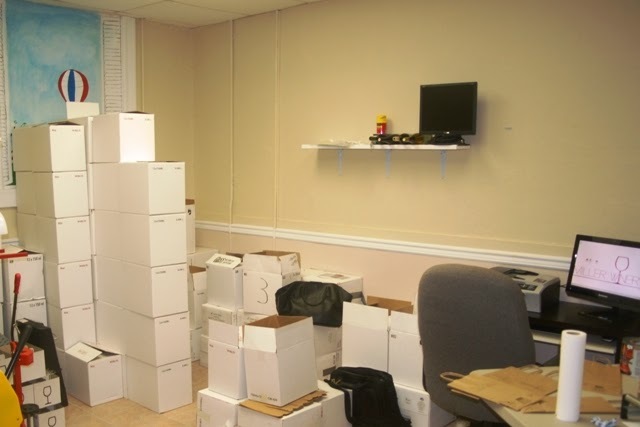 There is also an office/production room for packing and shipping. 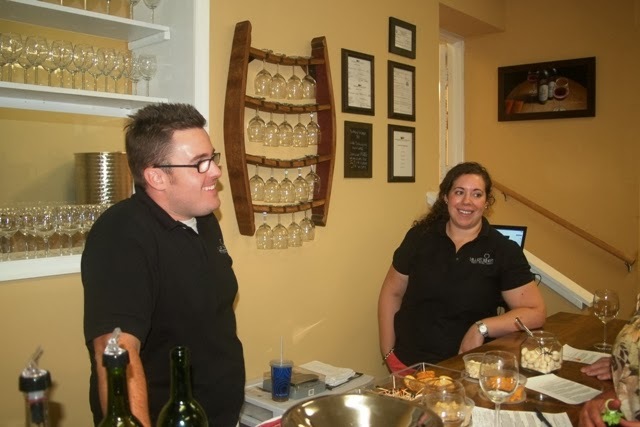 Jason already has expansion plans to bring the winery out to the front of Royal Street, with outdoor café tables looking out at the Warren County Courthouse. 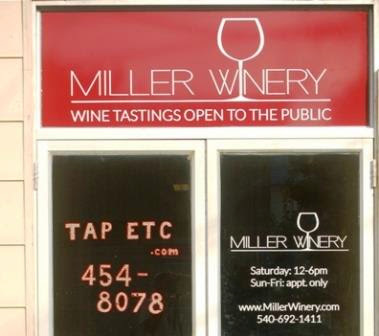 Everything at Miller Winery is done by hand – from corking the bottles (Pomeroy learned how intensive that is when our own Miller hand-corked the Wine Dog wine) to the bags, which Amber hand-stamps with the Miller label. The Miller Winery opened with Jason pouring four wines. 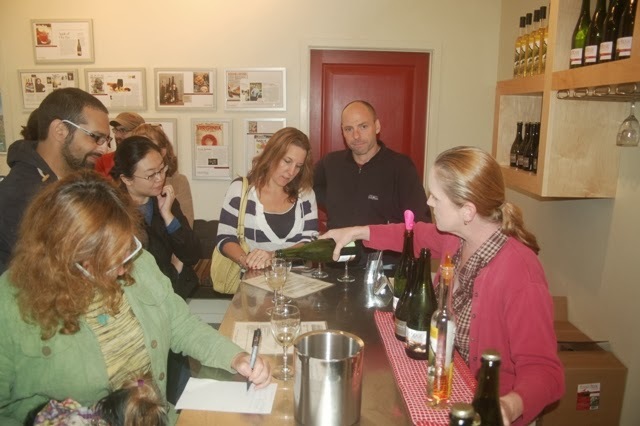 The fifth, the Chardonnay, is awaiting label approval – apparently delayed by the government shutdown. “We tried to come out the door with something that hits everybody’s palate,” explained Jason. 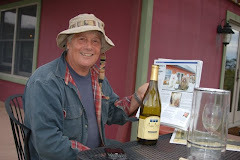 “Something” includes two whites – a German-style Riesling and a Seyval Blanc – and a pair of reds. 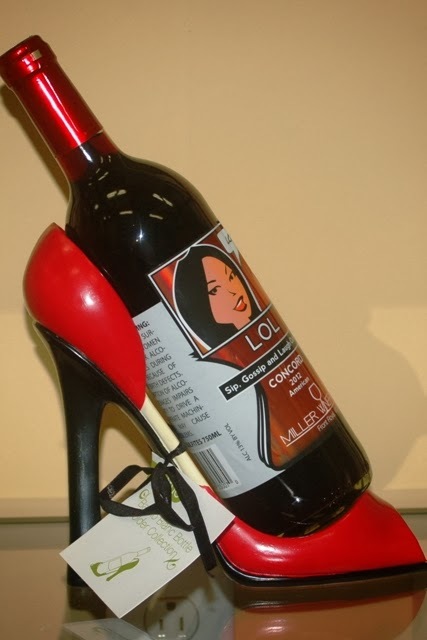 The first – aptly named LOL - was an amusing wine made from Concord grapes, with a Welch’s jelly nose accompanying a more sophisticated taste that still remains sweet on the palate. 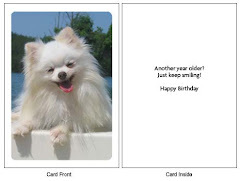 Ecco lapped it up. 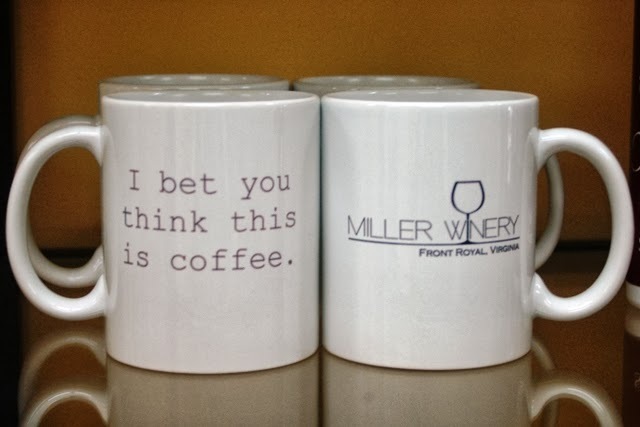 (Gotta love the Miller humor). 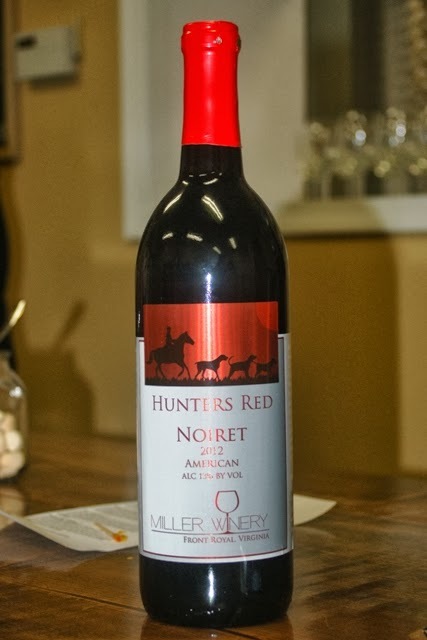 Pomeroy preferred the smooth, rich and slightly peppery Hunter’s Red – made from the Noiret grape, a disease resistant hybrid developed at Cornell. 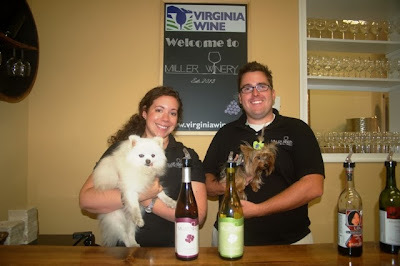 While the current run of wines are made from grapes purchased out-of-state, the Millers will be producing true Virginia wine. 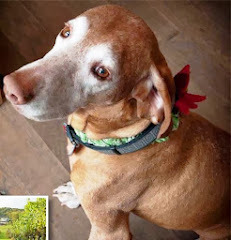 They have planted a 5-acre vineyard (managed by Jason’s parents) in Bumpass, Virginia (near Lake Anna). 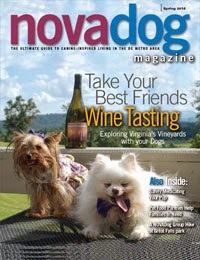 The urban winery concept appealed to these Wine-Dogs-about-Town, a welcome addition to the flourishing Virginia industry. Yep, it's the right time for Miller Time!